In the Bath Time Baby Gift Basket. 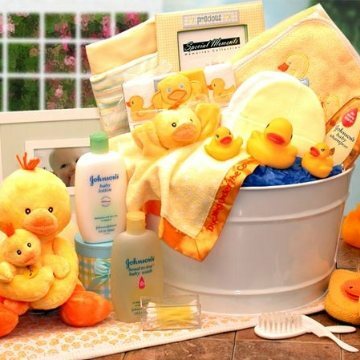 Cozy bath accessories include a hooded bath towel, a baby picture frame, and an ultra soft "Duckling Under the Covers" blanket. Send the Bath Time Baby gift, available in 2 sizes, to your favorite bath time baby! Medium Includes: Baby Wash Tub, Johnson & Johnson Tearless Baby Shampoo 7 oz., 2 100% Cotton TeeShirts, Hooded Baby Bath Towel (various designs), 2 Baby Caps, 4 Terry Cloth Wash Cloths, 5x7 Baby Picture Frame (holds a 3x5 photo), 3 Rubber Ducks, Baby Brush & Comb Set, Ultra Soft Satin Edged Baby Duckling Blanket with Embroidery "Duckling Under the Covers", (Baby duck doubles as a finger puppet). Large Includes: Baby Wash Tub, Johnson & Johnson Tearless Baby Shampoo 7 oz., Russ Berrie Musical Mommy & Me Duckling Plays "Old McDonald Had a Farm", 2 100% Cotton Tee Shirts, Hooded Baby Bath Towel (various designs), 2 Baby Caps, 4 Terry Cloth Wash Cloths, 5x7 Baby Picture Frame (holds a 3x5 photo), 3 Rubber Ducks, Baby Booties, Baby Brush & Comb Set, Ultra Soft Satin Edged Baby Duckling Blanket with Embroidery "Duckling Under the Covers", (Baby duck doubles as a finger puppet), Johnson & Johnson Baby Lotion 9 oz., Johnson & Johnson Baby Wash 9 oz. Medium gift weighs 8 lbs and large weighs 10 lbs.